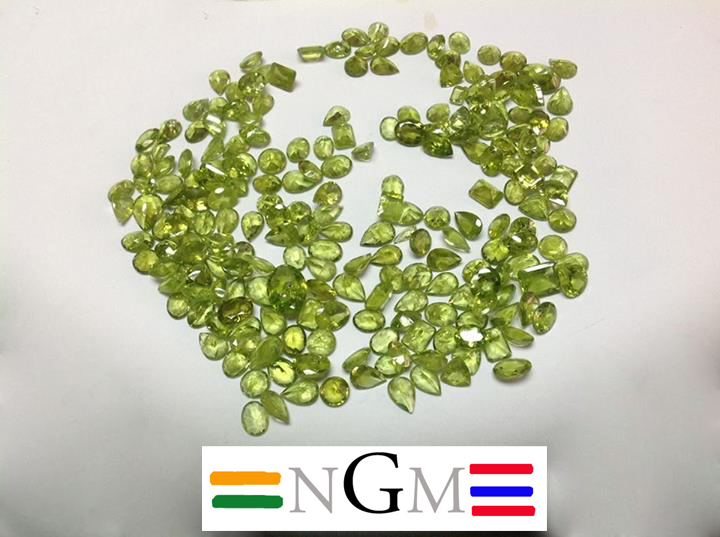 Happen to be Looking for a Professional Supplier of Wholesale Peridot from Thailand? What is peridot? History? Birthstone? Properties? Peridot is a green color, translucent to transparent stone with 6.5-7 hardness on the MOHS scale, a 3.2-4.3 specific gravity and 1.64-1.70 refractive index. Whenever we read the history of the Peridot Gemstone we see that it says that the Egyptians took it as ‘Topaz’ and people in Medieval times took it as ‘Emerald’. The first Peridot was mined by Egyptians in the Red Sea (now called Zarbargad). At that time mining was very risky there because of snakes and later an Egyptian ruler (Pharaoh) drove all the snakes into the sea. This vivid green gemstone comes with a slight tint of gold and yellow, which you can refer it as the ‘color of summer’ and that’s why it is the birthstone of August. The history of this stone is very interesting as Romans were also fond of its vivid green color and they named it ‘Emerald of the evening’. The best Peridot is known as Kashmir Peridot. The reason is because in 1990 in Kashmir, and just a few years before the establishment of Navneet Gems & Minerals, there was a huge discovery of a mine that was giving out brilliant colors of Peridot. Thats why historically the best Peridot is known as Kashmir Peridot, even though there are only a few very rare Peridot stones that actually come from Kashmir. Why should you choose us as a Supplier of Wholesale Loose Peridot Gemstones? We are a Wholesale Manufacturer and Supplier of Peridot Gems and running our factories in Jaipur, India and in Bangkok, Thailand. We cut big size stones over 7 carats in Bangkok and all calibrated sizes and shapes (2mm, 3mm, 4mm, 5mm, 6mm, 7mm, 8mm, 9mm, 10mm rounds, cushions, hearts 6×4, 7×5, 8×6, 9×7 and other sizes ovals, octagons, pears etc.) in India. Our main sources of raw material are from Pakistan (which is near India), Myanmar (Burma) and Vietnam. We manufacture different qualities as per the requirements of the market. If you want commercial quality with light color or you want top grade quality for high end jewelry then no other supplier can provide better services and prices than us. Since 1993, Navneet Gems & Minerals, had an interest in all Semi Precious Stones, especially Peridot because of its wide usage in local Thai Silver Jewellery, known wordwide for its high quality jewelry. 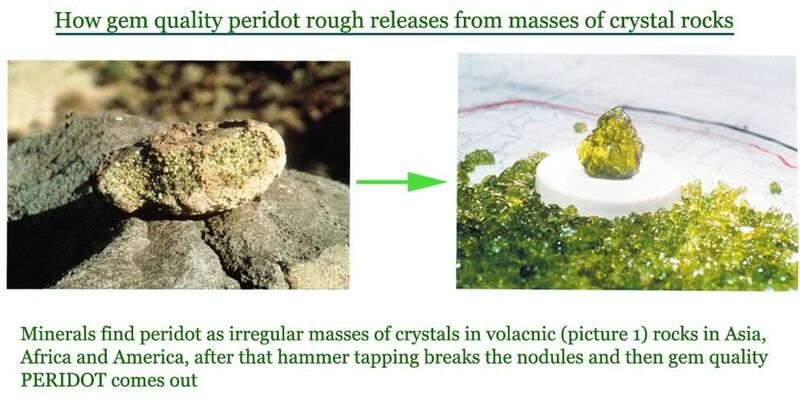 Moreover, that is why NGM made sure all their products were of high quality, as well as our Peridot. As we showed in the quality chart of Peridot, AAA Grade Peridot comes with no inclusions (mostly inclusions in peridot found as black dots and cracks inside). When we compare with other Quartz and Topaz stones (like amethyst, citrine, blue topaz and others) then big sizes are easily available in other gems at lower prices. For example amethyst 1 carat size comes at 0.60 usd per carat and 10 carats is available at 2.50 usd per carat. BUT it is not the same case with Peridot. In the case of peridot, small sizes are cheaper till 6mm but above 6mm prices jump drastically. Even at this stage, after 18 years, we get our Peridot directly from our sources and this keeps us ahead of the competition. 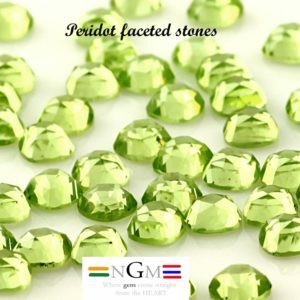 Peridot is a beautiful green stone, and we at Navneet Gems & Minerals deal in the finest stones. Moreover, Peridot’s green color gives a symbol of Greenery or Environmentally friendly. 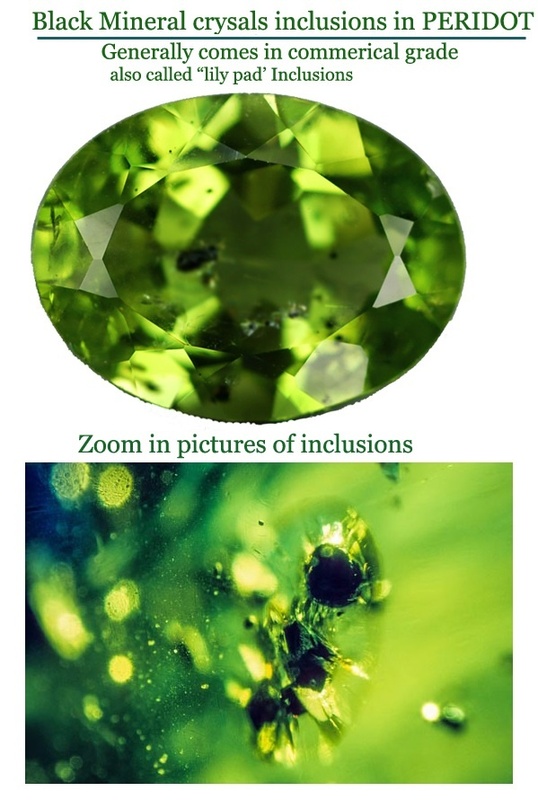 Size: Regular sizes of Peridot are better found in nature, bigger sizes are rare. Please get in touch with us as soon as possible for serious buyers of Peridot at wholesale factory prices. How to choose the best Peridot Gemstone? and Where are the mines of Peridot where it comes from? In this section we will share the information about how to judge gem quality of this stone. The same quality factors (Size of the stone, clarity, color and shape) work in this stone as well. The color ranges from green to yellowish green with a golden and brown tint, but the finest hue and color is saturated green to slightly yellow green and no brown tint. In calibrated sizes, there are two different qualities available in the market. One is with good color but slight black spots and milky inclusions, another one is a light color but clear. Inclusions are dark chromite crystals and called ‘lily pads’ (found more in commercial grade). Big sizes over 6 carat Peridots are not regular and not easily available in good color and quality (free of black spots and clear). Mines of this stone are available in different countries like Pakistan, Myanmar, USA (New Mexico), Vietnam and other countries. Every area where this stone is mined, is famous for different types and can be categorize based on color and quality. Pakistani material is yellowish green, Myanmar material is deep-green and the material from New Mexico and Vietnam is brownish yellow. The finest of the material comes from Pakistan and Myanmar and low quality comes from New Mexico and a few other countries. 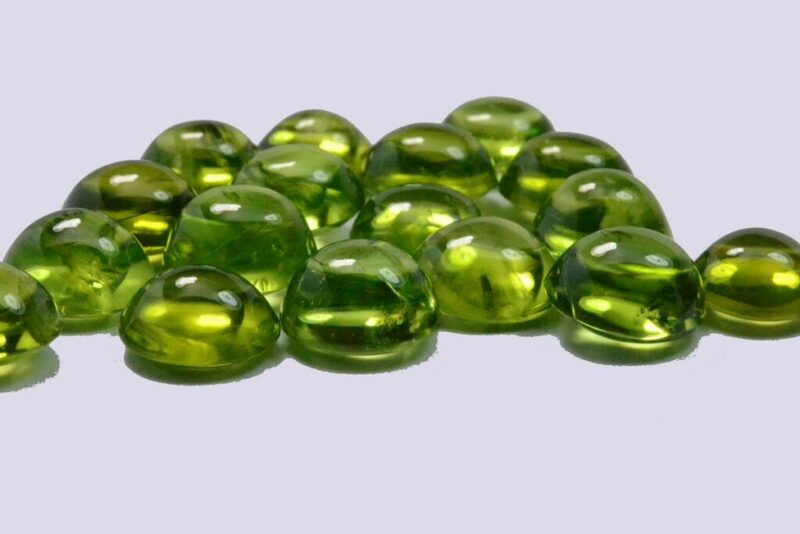 Why you should choose us as a supplier of wholesale loose Peridot Gemstones? We are wholesale manufacturer and supplier of Peridot gems and running our factory in Jaipur, India and Bangkok, Thailand. We cut big size stones over 7 carats in Bangkok and all calibrated sizes and shapes (2mm, 3mm, 4mm, 5mm, 6mm, 7mm, 8mm, 9mm, 10mm rounds, cushions, hearts 6×4, 7×5, 8×6, 9×7 and other sizes ovals, octagons, pears etc.) in India. Our main sources of raw material are Pakistan (near India), Burma and Vietnam. We are manufacturing different qualities as per market’s requirements. If you want commercial quality with light color or you want top grade quality for high end jewelry then no other supplier can provide better services and prices than us. Peridot Cabochons -We specialize in both cabochons and faceted stones in A, AA and AAA grade, though sometimes our customers ask for low to medium grade cabochons to use in silver jewelry so we also complete their orders per their requirements as well. We are manufacturing Cabochons in all small from 1.5, 2mm to 9mm sizes. If you are looking for top quality material in bigger than 9mm size then it is not possible for us to manufacture without slight inclusions. The Market and Sources of Loose Peridot Gemstone– This stone comes in the same category as that of Tourmaline, Tanzanite, Sapphire, Ruby etc. which have 2 separate markets. One is for jewelry designers and manufacturers (who buy medium quality calibrated sizes) and the other one is for collectors (who buy big pieces as investments and heirlooms). If we talk about the market price then there is not big price difference between 7×5 to 8×6 or 9×7 ovals but when you go for 10×8 then the price graph increases rapidly because of unavailability for raw material. India and Thailand are the only big hubs for gemstone cuttings and Thailand cutting is known for expensive gems. Our gems factory cutters in Bangkok, TH are skilled and experienced so they cut the stone in a way that they can balance the weight retention and the gem’s brilliance. We cut calibrated sizes in our gems factory in India because labor charges are cheap there as compared to Thailand. Contact Us to buy Wholesale Peridot or Retail Peridot Gemstone – Please send your inquiry with sizes, shapes and qualities and we will reply to you promptly.